You know, this world is full of the curse of sin and it just plain hurts to live in it sometimes. We see war, destruction, natural tragedies and man made tragedies. People say, ” why does God do this to us?” Other people say that it isn’t God doing it, it is the curse of sin. A lot of people don’t understand that term, ” the curse of sin.” What in the world does that mean anyway? God made the world perfect and he gave us a choice to live in this world of perfection. When Adam and Eve ( the first created people) chose to go against what God wanted-for them to live in perfection- they brought the consequences of sin onto themselves and the world. Disobedience. Let’s look at it this way, you tell your child not to touch a hot stove and they do it anyway and get burned. Same thing. Now they suffer the consequence of touching the hot stove- the owwie of a burn on their skin. It leaves a scar. Tells a story. Our choices determine the consequences and they can be good ones or bad ones. So it isn’t God doing it to us-it’s us! The bible tells a story of good vs evil. Right from the beginning to the end. All throughout it God uses people who are not perfect to do his work. He uses murderers, adulterers, drunks, lepers, blind, deaf and lame people. He uses the worst of the worst to tell his story-to get our attention. It can be a hard read and it can be heart wrenching and radical. Sometimes it is even unbelievable to the human mind. I mean how could a gang of soldiers nail a human being to a cross and then watch him die? But that’s not the unbelievable part-this is: that that sinless, perfect man died and was resurrected and today he lives! He is just waiting for you to call out to him so he can show you what love is. He promises us all throughout the bible that he will never leave us and that he will always love us-no matter what. We must seek him out and build a relationship with him. Your mom can’t do it for you, your Dad can’t save you, and your friends might make fun of you. But youk now what? None of that matters-because Jesus loves you for you and he will be with you forever. Call on him and He will be there. No matter what you have done and I mean that- He wants you! He will take that tragedy in your life and turn it around into something beautiful that will glorify HIM! God loves you for just who you are…right now, today. This song says it well…. I am so proud of the kids in our youth group! They have come together to bring this wonderful event to their school. They have faced adversity and overcome it too! God is good! They are collecting shoes for the kids in Nica. They would like to see the shoes circle the track at the high school! So, let’s all join in and take a pair, or two, of shoes and show the kids in NICA how much they are loved by Carroll County! So bring some shoes and help break the cycle. ***This event is for the entire shoe collection week, not just the drop off day. Less than 50% of Nicaraguan children will graduate from High School. On average, Nicaraguans complete less than 5 years of schooling. Many children don’t receive the most minimal education because they are ashamed to attend school in their bare feet. I did this at the Layspeaker training a few weeks ago. Plugged in! 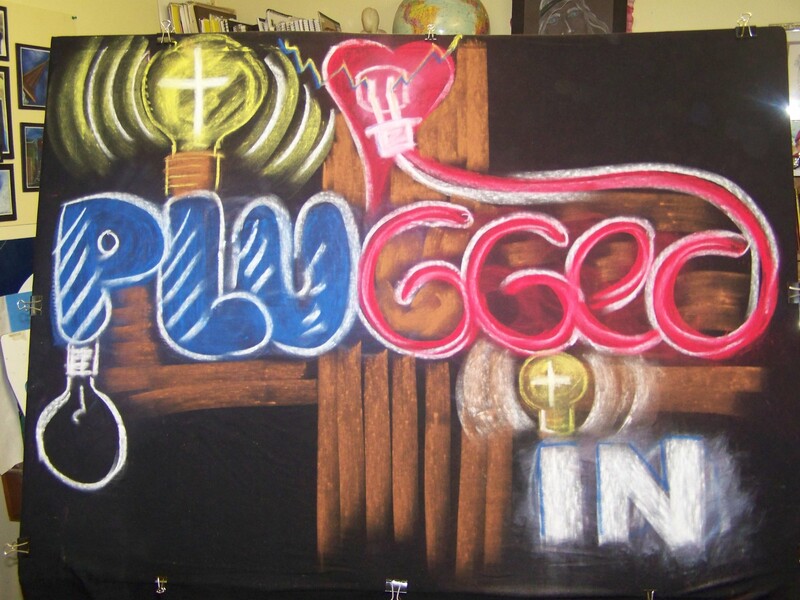 When we plug into God we get turned on! When we don’t- we are empty-no light. This is a drawing I did at the end of last year-2010. The drug usage in our country is overwhelming. It is in every neighborhood-including my own. Meth is rampant and our children are faced with drugs in our schools. It is too easy to “get.” As a parent we have to hyper vigilant, know where our kids are and what they are doing. We may even have to choose their friends. These are steps we all take and at the same time they are not a guarantee that nothing will happen by taking these steps. At the time I did this I had found out about a drug situation very near to home. It makes very uncomfortable. The year before this there was a kid on the bus who was huffing and it was very scary to hear about, much less witness. My oldest daughter was a witness to it and actually tried to stop it. It could have easily have been her and I am thankful that it wasn’t. Our kids need guidance, they need love, kindness and compassion. They need Jesus. Some even need tough love. The hardest kind. We must be vigilant in praying for our communities, schools and children to be drug free. This drawing depicts a syringe-not something we see everyday and it is shocking. It says ADDICTED. But look what’s coming out of it. God’s Word, love, hope, compassion and healing. Each drop has a scripture on it. We are to be so covered up in God that we want to inject him into our veins. Isaiah was told to “EAT THIS SCROLL.” What was on the scroll? The words of God. We are to get God into every fiber of our being. This means bible study, finding a church, fellowship with other Christians, teaching, preaching and yes, even drawing. God can be found in everything if we will just take the time to LOOK. We need to be in constant prayer and listening at all times. Even when it seems weird-like this drawing. When I am drawing in my studio- it is a time of worship and a time of concentrated listening to what God is trying to say through the art. I may understand it totally but that doesn’t mean others do, just like scripture. It is deep. This is how I get to share God with people, by telling them what the picture says. God uses teachers, speakers and Pastors to explain His Word to us. He uses artist’s in the same way- to tell His story in a different way. Each artist uses their own style to get this across. We have many bible versions-all written in a different form-all saying the same thing. Each one speaks to people differently. Art is like this too. I am taking the Bethel bible study course and in this course there are “concepts and artist renderings” to help us remember what that scripture means. A picture goes with a concept/ scripture. Each picture has an explanation. Without the explanation it is hard to understand the picture. Michelangelo, Rembrandt and Picasso all need interpreting too. Sure, you can look at the painting without it but you are missing the deeper meaning if you do. If you are like me, you want to know the deeper meaning so you can understand the artist’s goal. Many artist’s are misinterpreted, much in the same way scripture is. You have to understand the heart to understand the art. You must know the heart of God to hear what the scriptures say too. You can skim them over and think you know what they mean-I do this a lot-and I don’t take the time to dig deeper, but I am learning. It’s in the digging that we find the Truth and God always speaks Truth, we are the ones who misinterpret, not God. This is why I am taking the Bethel Bible study course- to dig deeper and to have the active, living Word of God living inside of my heart and my veins so that when I speak, move or draw-He comes out. Being able to do that requires commitment, time and devotion. It also requires a fellowship with other believers and a Godly leader. You cannot do it alone. I love my Bethel class and it has been the most amazing journey of the heart ever. In fact, I am considering retaking it again at a later date. I have another year to go with my classmates and I am looking forward to what God has in store for us individually and collectively-as a body of Believers. He has put us together for a reason and we have learned much from one another. I think the biggest mistake I made was thinking that it was going to be boring and no fun. I was soooooo wrong! We laugh and cut up and have fun! We have also cried and prayed together. Each of has seen God in a new light, in a new area and in a new way. For me it has been glorious to see how God uses art to teach. I was made for this class. If you are interested in taking Bethel in 2012, please contact me and I will be glad to discuss this with you. If you feel even the slightest twinge or thought about it- start praying about it now. I will be happy to pray with you and for you. We have been blessed so that we can BE a blessing! I guarantee you that you meet the voice of Truth in this class. I did. I was looking through some old sketchbooks this past week and I came across this card that I had drawn back in January. I had slipped it inside the sketch pocket and forgot about it. I do that a lot. I remember Evan telling me, right after we first met, that I should do a drawing of a hand with a hole in it and then a scene inside the hole. I haven’t attempted that one yet-but it did lead me to doing this eye with a scene in it. The first time I really saw what Jesus went through was when I watched the “Passion”. I cried like a baby and it has forever altered my own eyesight. I started seeing many things differently after that. One of them was communion. I have not taken communion the same way since then. When I look into that cup I see this scene. I can’t bring myself to paint a bloodied Jesus-it’s just not pretty. I may one day though. I see the perfect love of God hanging on the cross-purity and obedience. There is a tear drop inside a teardrop-this is my weeping for our Savior, my yearning to be with him forever. Today the cross is EMPTY and I am humbled to know that God would love even me, an unworthy sinner who has been covered by the blood of Jesus. Maybe that’s why the blood isn’t on the drawing-because it’s on me! Where are you in your walk? Have you SEEN Jesus with your spiritual eyes? I pray that you will if you haven’t and if you have I pray that you will share Jesus with someone today. Be the Jesus that people need to feel, see, touch, hear and experience. He died for each of us and his command is for us to tell the world. You can use your blog, your FB, your twitter, your Youtube, you cell phone, your voice, your actions, your compassion, your love and your life to do this. Just don’t NOT do it. Obedience always brings blessings. We were created to BE A BLESSING! So, I guess I went through a little unbelief there but today I am sure of what He is saying! Hallelujah! I can’t share it yet- just wanted you to be on the lookout for an awesome testimony! I am so excited about what God is doing at FUMC Hillsville/OOTBWC! I have gotten to know a lot of the people there and the thirst they have for God is overflowing. I am so blessed to be a part of this amazing time in our church. God is doing great things and he is bringing people to the BOX in droves. The JOY I feel there is uncontainable and unexplainable! It’s not just me- but many, many, many others. This Sunday we are doing something a little different. If you are curious- just come out and see. I can’t say, because it’s a surprise and no one wants to ruin a surprise! But what I can say is that you’ll never forget it and you will experience God in a new way! So, join us at one of our services-9 am and 10:30 am. 516 Main Street-Hillsville! Just follow the crowd! This song is for my new friend-Harrison! Love you! Just when I think I can’t be filled with any more JOY – God sends me more! Whoa! Fill ‘er up-let it overflow! I am sooooooooo excited to introduce Cindy Brown to you! 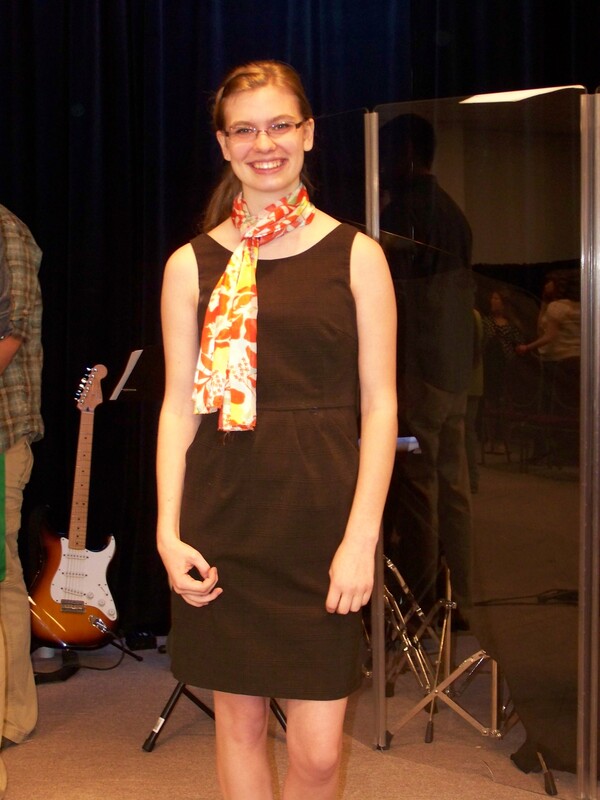 She is an artist that God has sent to FUMC/OOTBWC! I am secretly hoping that she can help me with the Art Ministry! I am soooo excited! We seem to share the same heart in our drawings- check this out! Do you see what I see? We are all in our own little boxes and we need other people to help us come out. Just like Lazarus needed his friends to unwrap him. The work that is being done at out of the Box Worship Center is doing this! 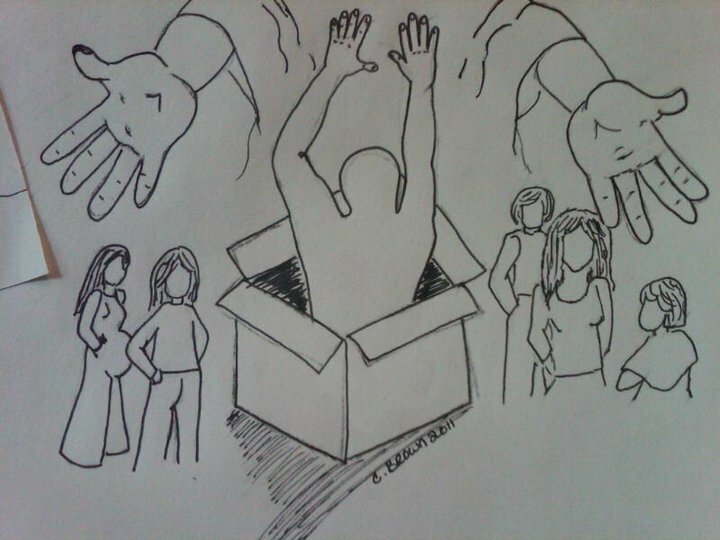 People are being raised up and out of their boxes by the mighty hand of GOD! People of all shapes and sizes. I just love how Cindy has put a pregnant woman into the picture. It speaks volumes to me of NEW LIFE in CHRIST! WOW! The person IN the box seems to be eager to reach Christ. We should all be this way! Christ’s arms are wide and open and waiting for you! Are you looking for a safe place to call “home” on Sunday mornings? Well, this is that place. Jeans and tees. Come as you are. we love you just the way you are. Today I was told that a young couple who visited FUMC/ OOTBWC for the first time yesterday said this: ” wow, they really DON’T judge you there. We are going back next Sunday!” God is at work people! He wants you to join us! Sunday morning services are at 9 am and 10:30 am. Hope to see you there! She is an awesome yoiung woman whom I have had the pleasure of getting to know this year through OOTB youth center. She has been involved in the Art Ministry along with several other youth. She is a woman who has a heart that yearns for God. I just love her and what God is doing through our young people! Welcome Stephanie! Do you believe in REVIVAL? I do! Why? I see it in the faces and the eyes of the people I sit next to everyday. People like you and me. All broken and in pieces like a puzzle. Some of us are missing pieces and need others to help us find them. That missing piece might be grace, hope or love. Or it could just be an invitation to meet the greatest friend you’ll ever have. Jesus. I saw Jesus working in our youth last night at Layspeaker training. Wow! They all blew my socks off! Passionate, fun, funny and oh so in love with thier BFF-Jesus Christ. 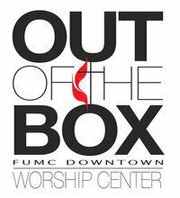 You see I attend FUMC Hillsville and this family of beleivers has made a radical change to start a new place downtown called Out of the Box Worship Center. It’s something different to meet the needs of today. It is a safe place for broken people to go to get help in picking up thier pieces. I have been overwhelmed with the JOY of God in doing work here. It has been a blessing of a different kind. One that I never could’ve imagined had I not accepted the mission to follow God. I never thought I would be a missionary on Main Street in Hillsville. But God did… and when you really get down to the brass tacks we ar ALL missionaries wherever we go. We must learn to think with a missionary mind and body. Looking on the world in love and with compassion, not pointing fingers, but joining God where He is working in your own home town. I have experienced God in so many different ways this week alone that it is hard to count all the ways. I see Him in your smiling faces, your hurting eyes, your great big bear hugs, when your face lights up and your eyes bug out of your head. I have seen Him in dancing feet, raised arms and voices singing praises in unision to our Creator. I have seen him from a distance in the full moon of the weekend and I stop and stand in awe and ask myself, ‘ why do you love me Lord? why? I am so unworthy of anything you have ever given me…I just don’t understand it.” Then along comes my 10 year old to remind me of how great our God IS as she shares her compassionate heart with me about how the kids on the bus were making fun of the bus driver and she didn’t like it so she moved. I saw God in her little face and eyes when she went to her first Christian concert over the weekend. She was awestruck! She experienced God in a new way and I got to witness the look on her face as she did! Priceless! For me that was the concert! Then I get in my teenage daughter’s truck for the first time and I see God everywhere inside the cab. I sit and weep. There is the little wooden cross, I made her last year, hanging from the mirror. Hanging with it is the armor necklace that Charlie gave her way back in 6th grade SS. On the back is says …” Be of good courage” from Joshua. Then I see her “Is It Holy bracelet” wrapped around a section of the steering wheel. On the seat next to me are her bible study notes with the title “Blessings…” All these things are a reminder to her of how to live her life. Sitting in this moment I am overhwlemed with how important God is to her and I thank God for blessing me with such a Spirit filled daughter who yearns for her Creator. I am humbled to the core. I love what God has brought me to-peace and joy in a life lived in mission for HIM. Nothing else matters. The naysayers don’t matter, the money doesn’t matter, the unknown doesn’t even matter. Why? Because God holds it all in the palm of His hand and ONLY HE KNOWS THE PLANS HE HAS FOR US! We are to follow in His footsteps and TRUST and OBEY. That’s it. He will do the rest. Thank you LORD for never giving up on me!!! PS: thanks to the Bald Guy for sharing your passion with the rest of us and thanks to the crazy fun loving motorcycle riding Pastor Ty for praying God’s blessings over us as continue to work together for Him. My walk has been a long odd one–but for the first time in my life, at age soon to be 37, I am now understanding the process and changing power of Grace, and Mercy, and that Salvation is a gift–a cleansing-a rebirth. There has been a revival of my soul that was until recently gasping for breath. I can’t explain it—there are no words! I’m still me—but things have changed—God is breaking away all the things that weighed me down. To break it down, when I was little I looked at God as a judge in a black robe. I thought to get to heaven you had to be perfect-like I thought everyone around me in church was. I tried to “earn” His love, and then got completely turned off and thought it was hopeless—which ultimately made me hopeless and consumed by worries-because I thought I had to control and fix everything—both at home and at work. Trust me, that is one pit I wouldn’t wish on ANYONE–to believe in God but also think that there’s NO WAY He could love you? That is blackness in a bottomless hole. Believe me. I’ve even been down the road of running away from His love and thinking I knew how to handle my own life. I didn’t realize it at the time but that was exactly what I was doing. I was wrapped up in sin and self-centeredness. It was all about me-what I wanted. I’ve done just about everything either thinking I didn’t deserve God’s Grace, couldn’t earn it and then feeling condemned because I couldn’t, or being completely an idiot and thinking I could survive without it. I still have those thoughts of “not deserving” creeping back in, especially lately (I think because I’ve gotten plugged back in and the devil is not happy), but the difference is now I’m armed. And I’m arming myself more every day. I have been in an awful place-my soul was dark, and bitter-I couldn’t even see it at the time—and it wasn’t until one friend prayed with me one night and literally commanded Satan to leave me alone, another wrote to me, and my husband stood calmly by my side praying the whole time, that my eyes were opened to what I was doing. So through my life, first I did what I thought I was supposed to out of fear, then I tried to do what I wanted to out of rebellion. I’ve hurt the ones I love the most, that loved me through all of it. I’ve done things through my life that would probably surprise you. I was acting in sin, and I almost walked away from everything. BUT-Thanks and praise to Him, God has not left me at any point in my life. Ever. It’s by His grace that I’m still breathing today. Even when I thought I was a “Christian”, I know now I still wasn’t getting it. I wasn’t grasping that Grace, and I sure wasn’t letting it change me. I see it now, looking back on EVERYTHING. He was pursuing me the whole time! Through my family, through my friends, He hammered me with His love that doesn’t know an end. Even when I was doing things I knew I shouldn’t, he was speaking to me, deep in my heart. He’s still hammering and I pray that He never quits. So surprise! I’m not perfect. I have stumbled, and fallen, rolled around in the mud—and then I sat and cried in it. THAT was when God said “Now, Kid–Are you Ready?” He picked me up, used His blood to clean me off, dried my tears, told Satan “This one is MINE” and is now holding my hand. I have begun a new and renewed walk with the One who revived me. Sometimes it feels sort of like bootcamp—I see the tests for what they are now, and I am constantly tested, must constantly be on the mark, must constantly stay connected to my new Commander. But it’s awesome and with His help I will stay on this course. He has put me at a place-Out of the Box Worship Center–and has surrounded me with people who love me exactly the way I am. There is transforming power in that church! I’m here to tell you: You may think you can’t trust Him–you may even think you don’t NEED to trust Him. But that trust–that faith, no matter how small it starts out, will connect you to the most awesome changing power you’ve ever felt in your life. It is a consuming fire that burns everything else out and begins to soften that metal in your heart so that God can mold it. It’s not easy–don’t fool yourself with that thought—LIFE is not easy. Things will not automatically get better for you—it’s not even about you—it’s about HIM. AND that fire can and will hurt, because God is molding and hammering me to this day—but I will take it over where I was ANY DAY. God is also not a genie to grant your wishes—God is God—whether you believe in Him or not–He does what He does, through you—for His will-His purposes that we can’t even begin to understand. Even where I was has a purpose. That black hole has a purpose. That’s where the faith and trust have to come in. Life on this earth is not easy, but God will give you new eyes and a new way of looking at things. It’s a walk–it’s a daily choice to follow Christ…and He will continually feed you what you need to grow. He WILL NOT LEAVE YOU-but He will also not leave you alone—as in expect to be changed. He will be with you till this earth is no more and forever after that. He promises. I don’t even know why I’m writing this–I’m just compelled to. I finally get it!! It’s clicking. Loud and clear. I owe it first and foremost to my Savior. 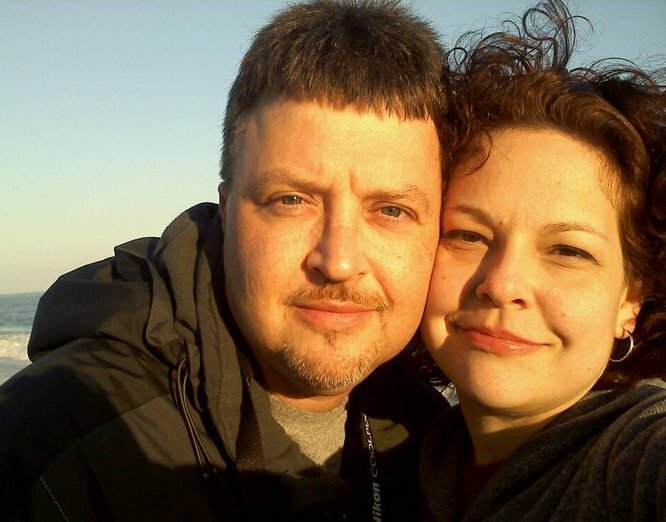 But also to my husband, who also NEVER gave up on me, and to my friends, who prayed with me and helped me to see-even though I was hurting them in the process, and to Out of the Box Worship Center, where I was led to back at the beginning of the year and have set out on a journey that is bringing me closer to God every single day. My prayer is for every soul to feel that fire and yield to it. If you yield to it—there are no chains on this earth that can hold you! Today’s journey goes to the Mount of Olives for a remarkable view of Jerusalem. Here they will see the Temple Mount, Dome of the Rock and the Garden of Gethsemane. They will visit the City of David and journey through time to see the Gihon Spring, Hezekiah’s Tunnel and the Pool of Siloam. In Bethlehem they will visit the cave where Jesus was born. I will venture to say that this will be a particularly emotional day for Betsy and the group. I know that visiting the Garden of Gethsemane would be emotional for me, since it is where Jesus prayed to the Father until his sweat came out like drops of blood. Hematradosis is caused when the small blood vessels in the face, particularly in the forehead, burst and allows the blood they were carrying to mingle with the sweat forming on their brow. Jesus was so anguished about what he knew he had to do that he sweated blood. Can you imagine having that much anguish? He did it thought didn’t he? And to think that we are the recipients of this great act of love…no picture can describe this. Today I will leave you with a song and your own thoughts. Please pray for those around you who do not have a relationship with Jesus Christ. Pray for God to send them someone who will show them TRUTH. Then pray for all those who are called to Preach the Gospel-that it be heard-that they are strengthened-that they are encouraged-and that we, the church, build them up. They need our help. No one can do this alone. There is strength in numbers. Some are called to pray, some to fast, some to work, some to give, some to teach, preach and rebuke. All these things require prayer. If we want to see a world saved then we too, must get on our knees in anguish and pray to our Father in Heaven.